Exporter of a wide range of products which include hi-frequency internal grinding spindles, high frequency deep hole grinding spindles, high frequency drives, high frequency spindles, high frequency drilling spindle and external grinding spindles. Our company is engaged in offering superior grade High Frequency Internal Grinding Spindles. These are offered with an In-built motor & are designed up to 50 KW Power, which is capable to meet all Internal Grinding critical requirements. It provides effective performance during running. Our Spindles are designed up to 1, 25,000 RPM. 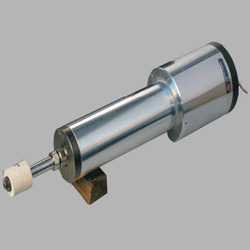 Motor is designed with very low loss of magnetic core lamination. The stator is glued with high class epoxy resins which do not allow insertion of moisture even during wet grinding wet grinding. The rotor is stacked with pure copper or silver bars to reduce electric losses. Continuous water cooling circuit is offered for constant cooling to High Frequency motor during operations. Internal Grinding operation for small medium & large dia bores. Banking on our enriched industry experience, we are engaged in offering a huge gamut of High Frequency Deep Hole Grinding Spindles. These Grinding Spindles are helpful in conditions where the standard spindle quill/ arbor are unable to reach. Our Spindles are generally tailor made designs and made to job suitability. These spindles are designed to be used to grind long bores or deep face. 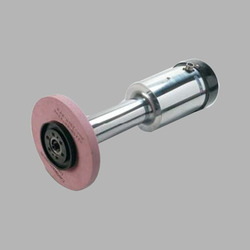 Hence, these spindles can be manufactured to grind deep bores even up to 2 Meters depth. These spindles are available in different sizes and the motors of these spindles are designed to suit different job specifications. Guaranteed concentric accuracy within 0.002 mm (2 microns). These spindles can be mounted on vertical turret lathe. Very easy to handle and maintain. High Frequency Drives are used to give Drive to High Frequency Spindles. 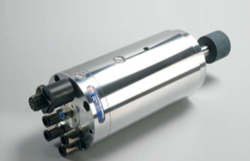 High Frequency drives can be programmed to run a spindle motor at a certain speed, to stop at a precise position, or to apply a specific amount of torque. 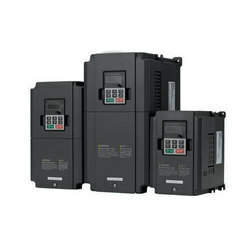 The modern AC variable speed drives can provide fast torque response and accurate speeds. CAPITAL offers High Frequency Drives upto 3000 Hz, and Power upto 100 Kw. These can also be supplied in Single Phase as well as Three Phase electrical supply. For more details on standard drives, please contact on info@capitalspindles.com. 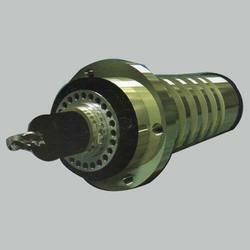 We are engaged in offering a wide range of High Frequency Spindles. These spindles are driven by a tangential belt system and used widely in milling applications. They are available in various sizes with a wide variety of speed and power range. The belt-driven milling spindles with their design flexibility, diversity, and performance are suitable for a wide range of milling applications. Its main purpose is to make the machined surface flat, angular or curved or can be milled to any combination of shapes. 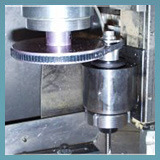 The milling spindle helps in rotating the cutter, and feeding it. Milling spindles are available with or without power draw-bar for machine tools. Available in Water as well as air cooled motors. Best option for high speed drilling/ Engraving applications. These superior make High Frequency External Grinding Spindles have High Frequency motor arrangement at the rear end. 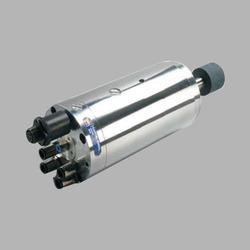 It is Air/ Water cooled motor depends upon RPM & Power. Previously it was laminated to get high RPM, due to new technology the desired RPM can be achieved with Built-In High Frequency motor with High Frequency converter. It can be programmed to CNC system to get desired RPM at critical profiles. For parting off and grind small & hardened jobs, it is very easy to get desired cutting speed on surface grinding. It may be horizontal or vertical; it will give remarkable surface finish for sharpening of cutter blades & High profile precision Components. We are engaged in offering a wide range of High Speed Spindles. 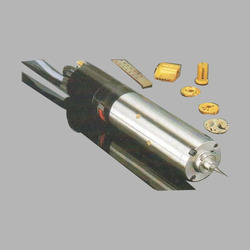 These spindles are driven by a tangential belt system and used widely in milling applications. They are available in various sizes with a wide variety of speed and power range. The belt-driven milling spindles with their design flexibility, diversity, and performance are suitable for a wide range of milling applications. Its main purpose is to make the machined surface flat, angular or curved or can be milled to any combination of shapes. The milling spindle helps in rotating the cutter, and feeding it. Milling spindles are available with or without power draw-bar for machine tools. Our company has achieved its leadership in offering a wide range of High Frequency Milling Spindles for Vertical Machining Centers & CNC milling machines. Low/High RPM can be achieved just with the rotation of potential meter or with interface to CNC program just to get desired cutting speed. These spindles are designed with taper shafts. Closed loop AC spindles are designed to provide high torque at low speed. 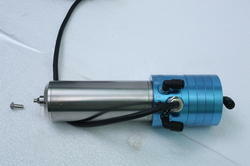 These Spindles are available with air purge, auto tool clamping system and power draw bar. These spindles have high torque value & power values. Very high axial & radial stiffness values. Metal removal rates are higher. We are the leading manufacturer and exporter of belt driven drilling spindles which are used in a number of industries. These Belt Driven Spindles are especially designed as per the specifications of clients. Widely used for drilling purposes, these feature better thrust capacity, long service life, sturdy construct etc. Looking for High Frequency Spindles ?